Concrete core drilling is used for creating circular openings for plumbing, as well as for structural and electrical installations. Core drill bits are available in diameters from ½” up to 60”. Michigan Concrete has drilled holes up to 120’ deep. Concrete core drilling is designed to remove the perimeter of the hole, an annulus of material rather than an entire cylinder of the material being drilled. The material left inside the drill bit is referred to as the core. 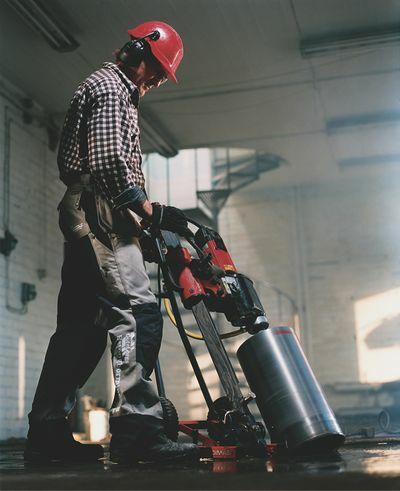 Concrete line drilling is an effective method for removing any thickness of concrete when other methods cannot be applied. Core holes are drilled in a series of overlapping holes around the perimeter of the desired area to be removed. This only becomes necessary if the concrete is too thick or if space restrictions don’t allow the other specialty tools. Core drilling may seem like a simplistic process and activity, but there are a variety of options to consider, from the type of diamond to the speed of the drill. However, our company has drilled thousands of holes in 30-plus years, and we have the knowledge to get your job done quickly. Whether you need one hole or 10,000 holes, give us a call today.